Dave McGillivray finished his first marathon at 18. He ran across the country at 23, then completed his first Ironman at 26. He has finished 46 Boston Marathons in a row, all while directing the race since 1988. Last January, he knocked off seven marathons on seven continents over the course of seven days in the World Marathon Challenge. At 64, there’s little in the endurance running world that he hasn’t achieved. Yet he’s never been as nervous about a run as he is right now. It’s 11 a.m. Monday morning in the fifth-floor cardiac exercise physiology lab at Massachusetts General Hospital in Boston. McGillivray’s wearing shorts without a shirt, his bare torso covered with a half-dozen electrical wires tucked around the six-inch-long scar running down the middle of his chest. He has a pulse-ox clip on his right forefinger and a bright blue face mask over his nose and mouth. Seven weeks ago, on October 12, he underwent triple bypass open heart surgery at the same hospital. While he began doing short walks on the rehab floor as soon as he was allowed, he’s done little exercise since then. Ten minutes earlier, he and McGillivray had discussed the morning’s goals. “Do you want to go hard?” Loomer asked. For the first 10 minutes, McGillivray walks at a steady 3.5 miles per hour (about 17:15 pace) with the treadmill on a 1-degree incline. Starting out, he looks awkward and lumbering, nervously clenching and unclenching his fists. But after about five minutes, he seems to relax and his stride gets smoother. His hands calm down, his arms swing low and rhythmically. It’s hard to banter with a mask covering your face, so McGillivray replies with a thumbs-up. 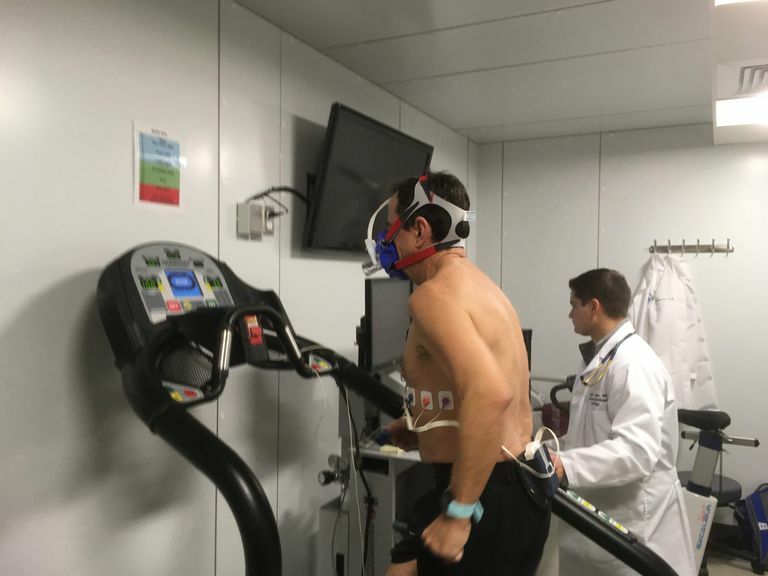 There’s a Borg RPE scale (which measures perceived exertion) on the wall in front of him, a bicycle ergometer tucked into the room’s far corner, and a half-dozen signed jerseys and photos on the near side wall. One of the pictures shows McGillivray striding across the Boston Marathon finish line a few years ago. All the memorabilia are signed, with expressions of gratitude, to the lab director, Dr. Aaron Baggish, McGillivray’s exercise cardiologist and comedical director of the Boston Marathon. Baggish is off in Switzerland today, consulting on a medical project for the International Olympic Committee. Decked out in wires monitoring his heart function, Dave McGillivray undergoes a cardio-pulmonary exercise test. McGillivray looks good for several minutes more, as the incline reaches 3 and then 5 percent. Then 13 minutes in, at 7 percent—roughly twice the steepness of Heartbreak Hill—he has to lean into the climb and trudge harder, using a purposeful arm push to keep going. Every 15 seconds, Loomer raises the incline. “You can break into a run whenever it feels right,” he says. McGillivray nods. “Give me a signal when you need to stop,” says Loomer, now eyeing McGillivray closely. At 18 minutes, McGillivray gives the sign. Loomer slows the treadmill to two miles per hour, telling McGillivray to hold onto the side rails and keep walking as a cooldown. Eventually, he stops the treadmill. “How’d you feel?” he asks the runner while removing the mask. For someone of McGillivray’s age, a 157 heart rate is pretty damn close to his maximum—near the equivalent to what a runner might experience in a 5K race. “I didn’t expect to be running that hard for a long time, for months and months,” McGillivray says. Thirty minutes later, he’s relaxing in a nearby cafe and reflecting on his test. He says he’s pleased. Excited even. But he’s been through enough in recent years to realize there could still be unexpected hurdles ahead—and one of the biggest might be himself. Like every other runner, McGillivray hopes to get a little faster again. Fourteen months ago, he ran a 3:46 at the Bay State Marathon. “With bad plumbing,” as he puts it. Now his plumbing has been rejiggered. He wonders if he could run sub-3:30 in a year or two. Because the eyeball results in the lab seemed clean and positive, the runner is hopeful that Dr. Baggish won’t uncover a serious issue, but rather counsel patience: Keep it slow and steady. For now at least, that’s fine. McGillivray says last April’s Boston Marathon was “miserable,” and he’s not talking about the wretched weather. He felt so physically bad prior to the 26.2 mile race, which he runs every year after the final marathoners have finished, that he packed a defibrillator into the car that accompanied him from Hopkinton to Boston. At the 2019 race, he’s expecting very different emotions. Older PostAUDIO: BOSTON MARATHON LEGEND DAVE MCGILLIVRAY TALKS ABOUT HIS BIGGEST CHALLENGE EVER ON HANK'S "MORSE ON SPORTS PODCAST"!